Zee, Friesian, showing at the Buckeye Baroque Show 2015. The word dressage in french means training. Specifically, a higher level of training than just the basics. Classical Dressage is a system of training that has evolved over centuries for the purpose (historically) of improving a horse's usefulness in battle. A horse that was useful in battle had many of the same qualities we seek in our horses today: obedient, agile, light (quick to respond with understanding), balanced, calm, strong, flexible, and sound. Training with Classical Dressage principles brings out these qualities in each individual horse according to it's own natural talents. Done knowledgeably, it helps to improve and compensate for the average (or poorly built) horse's natural weaknesses. In this way, it can be considered theraputic. Dressage training is systematic and each step forward should be attempted only when the horse has understood the last. Force has no place in correct dressage training. When the time is taken to prepare the horse for what is to be asked of it, understanding leads to trust in the trainer, obedience, and increased calmness. Very often a horse that is tense, resistant, or uncooperative does not understand, is unable to do, or thinks that it is unable to do what is being asked of it. As the trainer's understanding of the horse's physical body increases, his requests will make more sense to the horse and he will have more success. The primary goal of Classical Dressage training is to teach the horse to carry himself with his back relaxed and lifted, his core muscles engaged, and the joints of his hindquarters flexed increasingly underneath his body. The result is a top line that forms a bascule or arch. The arch is known to be the strongest shape in nature (or at least according to the VW people) and it is the strongest position for your horse to carry it's rider in. With the joints of his hindquarters bending and bearing weight underneath the body, the horse can transfer more of his weight to them and relieve the forehand. This is the physical requirement that allows the horse to become light, agile, and responsive. It will also keep him sounder longer as he is reducing concussion on his forelegs and, if the training is correct, all of the joints of the hind leg will share the load and bend evenly instead of the hocks being overloaded. Merlin, Saddlebred Belgian Cross, showing in Western Dressage. One might ask why must I teach the horse to do this, why does he not do it on his own? Of course, carrying a rider is not something a horse is born knowing how to do. In fact, the only thing his back muscles are physically able to do in response to a rider is to tense or relax. Tensing, or contracting the back muscles results in lifting the head, dropping the back, and disengaging the hindquarters - the opposite of what most riders are looking for from their horses. For the horse to carry the rider properly, he must learn to relax his back or topline muscles and use his underline muscles instead. Many horses have good reason to tense their backs when ridden - bouncing rider, rider not over strongest part of the horse's back, poorly fitting saddle, rider that leans or jerks on the reins, general tension born of a lack of understanding, fear, or dislike of it's job, etc. Even under the best of circumstances, the horse must be prepared gymnastically to release tension in the topline, engage it's core muscles (to lift the back), and engage the hind legs underneath the body. In a nutshell, dressage is a system of training that seeks to develop the horse in a way that works with, rather than against, the horse's body. 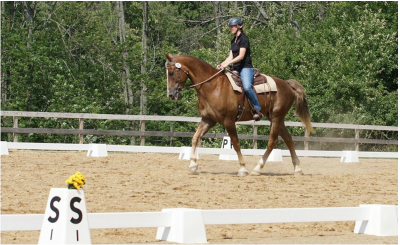 The end result of correct dressage training is a horse that is better equipped to do his job, which is to carry a rider and respond to his requests. Whatever your equine pursuits, nearly every equestrian wants their horse to be light on his feet, responsive, calm, without resistance, and sound. For the horse to have these qualities, his rider must have an understanding of how the horse's body is designed to work optimally. Every rider, wants their horse to be "light" - quick to respond to his requests, soft in the mouth - not requiring to be hauled on to get a stop or a turn. For this reason, riders of many disciplines use dressage training to improve their horses.